When I think about that time (now more than five years ago) I can’t help feeling a little upset at the messages I heard. I was told to eat more “quality” proteins like yogurt and cheese and lower fat meats and less junk. I’m sure the dietitian and doctor who told me that were well meaning. It’s the same message they probably told all their patients. But there is a difference between me and many patients diagnosed with diabetes or its precursor. I was not overweight and never have been. That’s important because the research indicates that simply by losing up to a fifth of their body weight, people can reverse diabetes. meats and higher levels of protein. With so much of the U.S. population at risk of diabetes, I wonder whether the science will win out or the pharmaceutical companies. A whole-food, plant-based diet can also be beneficial in the case of one of the most painful complications of diabetes, neuropathy. 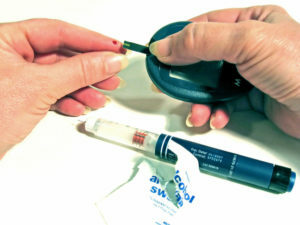 Around 50 percent of people with diabetes develop the condition and there is no medical cure. However, in one study of 21 patients suffering from neuropathy pain for up to 10 years were placed on a whole-food, plant-based diet. Meanwhile, science tells us the treatment and, for some, even the cure for type 2 diabetes. * The question remains whether people will adopt it, continue to make the pharmaceutical companies richer, or risk shortening our very lives. *At this point there is no known cure for type 1 diabetes, although a whole-food, plant-based lifestyle has helped some people to better manage their disease. Dunaief DM, Fuhrman J, Dunaief JL, et al. Glycemic and cardiovascular parameters improved in type 2 diabetes with the high nutrient density (HND) diet. Open Journal of Preventive Medicine. 2012;2(3):364–71. Anderson JW, Ward K. High-carbohydrate, high-fiber diets for insulin-treated men with diabetes mellitus. Am J Cin Nutr. 1979;32(11):2312–21. Ketosis and the Ketogenic Diet: Debunking 7 Misleading Statements. Mastering Diabetes.